Doing something as simple as removing leaves from walkways can help eliminate the risk of falls. As the air turns cooler and leaves drop from the trees, keeping in mind fall season safety tips help keep you and your family protected from seasonal dangers. • Make sure your home heating system is in good working order. • Have a professional evaluate the system and address any potential problems. • Have you chimneys inspected and cleaned. • Remember, if you are using a space heater, allow at least three feet of empty space around the heater. • Never use a stove or oven to heat your residence. • Walkways and stairs should be kept free of leaves and other objects that may cause slip-and-fall injuries. • Keep your driveway clear of leaves. • Wet leaves can create a slip hazard not only for walking but driving as well. • Use extra caution if you are cleaning your gutters. Shoes may become wet causing you to slip as you climb a ladder. • Make sure the ladder is at the correct angle and on solid ground. 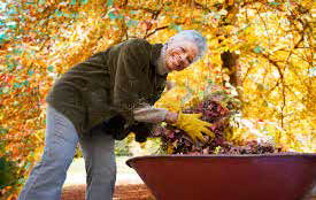 • Raking leaves can be stressful, take frequent breaks. • If you plan to burn leaves, first learn about outdoor burning regulations in your area. • Call your local fire department about outdoor burning regulations. • The burning of leaves or other plant debris should never be conducted near your home. • Check the weather forecasts before outdoor burning; you should never burn in windy conditions. • Remember that wet leaves on the roadway can become slippery, so use caution. • During the fall season, deer activity increases, so be alert to deer entering the roadway. • Leaves on the roadway can cover road hazards such a potholes or objects on the pavement. • Children love to play in piles of leaves. Use extra caution where leaves are piled at the curbside. By heeding these autumn hints, your fall season will be more enjoyable and safer. For more information or if you have any questions, call the Milwaukee Fire Prevention Bureau at 414-286-8948.